Who doesn’t love the look of big, billowy butterflies floating from flour perennial gardens? 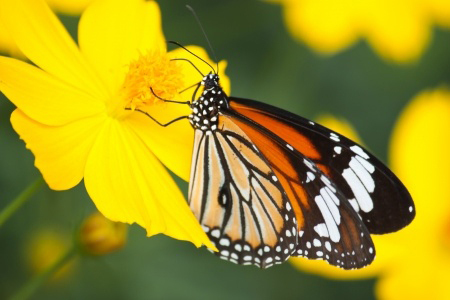 Butterflies are glamorous and we feel honored when they grace our yards with their beauty. Not so when folks bear witness to their larval forms; essentially the ugly duckling before one of the most spectacular events that Mother Nature has ever produced; metamorphosis! We all learned about this phenomenon reading The Hungry Caterpillar when we were kids. The caterpillar eats and eats and eats until it decides that the time is right to change into a winged version of itself….the critter that we identify with more. Although adult butterflies feed from nectar produced by a variety of flowers, what we need to realize is that many of these underappreciated caterpillars are host specific, feeding on only one type of plant. If the host plant is absent, the adult butterfly soon will be. Since native butterflies evolved with native communities; prairies, woodlands and wetlands, it only makes sense to plant native plants to attract native butterflies. 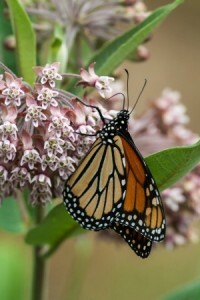 So, if you want to both attract and maintain a population of Monarch butterflies in your yard, plant a member of the milkweed family, the only plants that nurture the black, white and yellow zebra-striped larvae. 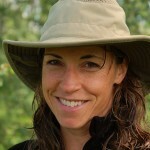 Jennifer Baker is owner of Sparrow Landscaping a design build landscaping company that focuses on using native plants. Sparrow works in Wisconsin, Northern Illinois and Eastern/Southern Minnesota.